The Township of Delaware lies along the Delaware River forming the western boundary of Hunterdon County. The Delaware and Raritan Canal parallels the river on the southern border of the township. North of the Township remains much as it looked in the 1700s, with rolling fields and picturesque barns belonging to farms that have changed little in the last two hundred years. The township is 37 square miles and the population is 4, 586. 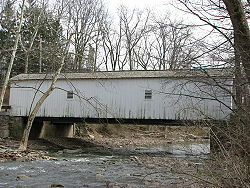 Sergeantsville and Rosemont are located within Delaware Township, and the sole remaining historic covered bridge in New Jersey crosses the Wickecheoke Creek between these historic communities. Portions of the township became Stockton Borough in the late 1800’s. Stockton is a quiet little River Town of .6 miles, with a population on 561, and boasts the smallest public school in New Jersey, and the 300 year old Stockton Inn, made famous by Richard Rogers in the Broadway hit “The Little Hotel with the Wishing Well.” Stockton is also home to the very popular, year round, Stockton Farmer’s Market. Delaware Twp & Stockton Real Estate Homes For Sale. Delaware Twp & Stockton Closed Real Estate Transactions.